Canadian Specialist Hospital is one of the largest private hospitals and the institution of choice for referrals from small and medium-sized medical centers that lack some of our specialized diagnostic and treatment facilities. 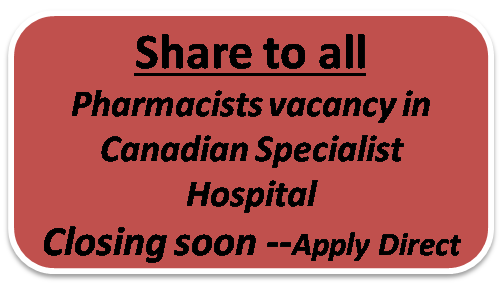 Here is a vacancy for Pharmacist in CSH. Find all details here. CSH has grown to become one of the most advanced and comprehensive healthcare institutions in the region. Experience: At least two (2) years experience in a hospital as a pharmacist. Please find the link in the above given first paragraph to get all details and apply online directly. Please note that the closing date is very near ..apply immediately.